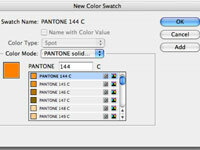 The Swatches panel in Adobe InDesign Creative Suite 5 helps you choose colors. The colors you use in a document can vary greatly depending on what you’re creating the document for. For example, one publication you make with InDesign may be for a catalog that has only two colors; another may be for the web, where many colors are available to you. You can create, apply, and edit colors from the Swatches panel. In addition to using this panel to create and edit tints and gradients and then apply them to objects on a page, you can also create and save solid colors. Choose Window→Swatches to open or expand the Swatches panel. 1Click the arrow in the upper right corner to open the Swatches panel menu; choose New Color Swatch. The New Color Swatch dialog box opens. 2Type a new name for the color swatch or leave the color named by color values. The colors in the Swatches panel appear this way as a default. This name is displayed next to the color swatch when it’s entered into the panel. 3Choose the color type from the Color Type drop-down list. Are you using a spot color (Pantone, for example) or CMYK (Cyan, Magenta, Yellow, Black)? From the Color Mode drop-down list, select a color mode. Many of the choices you see are prebuilt color libraries for various systems. 5Create the color by using the color sliders. Note that if you start with Black, you have to adjust that slider to the left to see the other colors. Click Add if you want to continue adding colors to the Swatches panel or click OK if this color is the only one you’re adding. The color or colors are added to the Swatches panel. 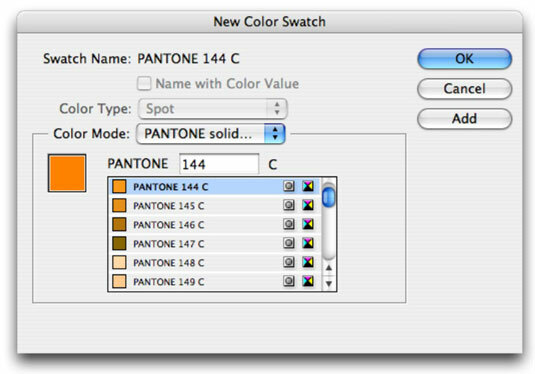 You can make changes to the swatch by selecting it in the Swatches panel and then choosing Swatch Options from the panel menu.